Trying for a new baby really is a journey into the unknown. Forgetting the obvious fun parts of natural procreation, for many people these times are long, stressful, emotional, tiring and filled with many low points. The subject of parenthood is always something we take for granted growing up, at some point in the future I will have children, for most of us we have no idea whether this is possible until we start trying (alternative parenting aside which is obviously a different biological reason for choosing fertility treatment). Once we start trying for a baby everyone’s journey into the unknown is very different. Even if we are successful we are still entering into an unknown future: What will the baby look like? Will it be a boy or a girl? Will it be healthy? What will its personality be like? Will I make a good parent? For those of us who have trouble conceiving that journey travels much deeper into the unknown and throws up so many questions: Why me? When do I start trying something else? What treatments should I try? Should I try natural treatments first? Which clinic? Which Doctor? Which Country? The list goes on with where do I go for Help? We catch up our Fertility Journey couples who are excited to announce their baby news, dealing with those awkward questions from friends and family. Eating to boost fertility, mini IVF and egg banking and much more. HOW CAN YOU LONG FOR SOMEONE WHO DOESN’T EXIST? PIECING TOGETHER THE SURROGACY PUZZLE… SINGLETON OR TWINS? 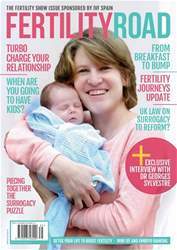 IS SURROGACY LAW REFORM FINALLY ON THE HORIZON?